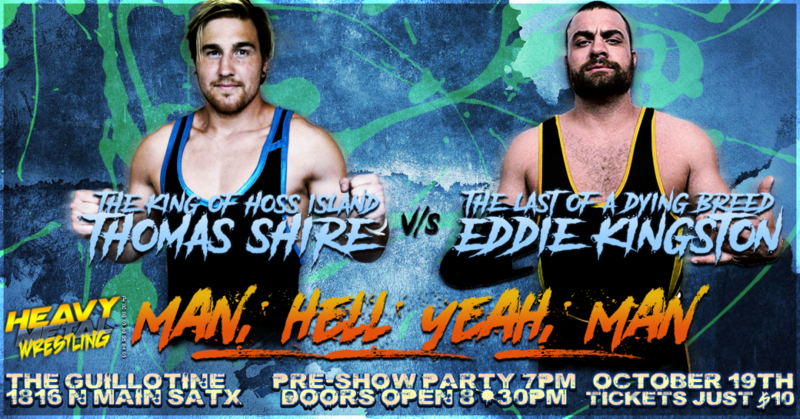 As announced at our last event, the Main Event of #ManHellYeahMan on October 19th will be “The King of Hoss Island” THOMAS SHIRE going one-on-one with “The Last of a Dying Breed” EDDIE KINGSTON, who makes his first appearance with #HeavyMetalWrestling! Thomas Shire is riding a massive wave of momentum after picking up a career-defining victory against PCO in September. In a bout where many fans felt Shire would die, he defied the odds and picked up a victory over the man who is not human anymore. On October 19th, “The King of Hoss Island” has his work cut out for him yet again, when he steps into the ring with one of the most ruthless individuals to ever step foot in the squared circle. Known around the globe for his ruthless and aggressiveness, Eddie Kingston is a no nonsense brawler from Yonkers, New York. With “The Last of the Dying Breed” out to prove he’s the most dangerous in the game, this match could be the hardest-hitting bout in Heavy Metal history. Will Thomas Shire continue his dominance of Heavy Metal Wrestling? Or can “The Mad King” dethrone “The King of Hoss Island”? Be there on October 19th to find out yourself!